These flashings enable windows on opposite sides of the ridge to be joined. Windows are linked together by the top element of the flashing. Combining windows in this way allows more natural light into the roof space. It creates a unique atmosphere, and provides an ideal skyward outlook. In cases where manual window operation is difficult or inconvenient, an electric control system can be installed. Because of their positioning at the ridge, PT-aluminium clad plastic windows, with their added moisture resistance, are recommended. 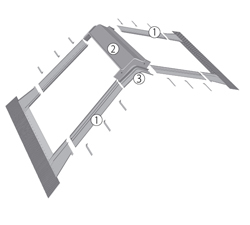 Windows joined at the ridge are fitted in roofs with pitches between 15° and 55°, though the internal roof angle should be between 70° and 150°. 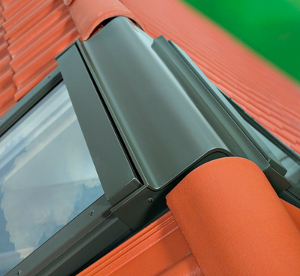 Ridge combination flashings can be manufactured from aluminium, copper or titanium-zinc. — for depth V (0): ERV-S, ERV-Z, ERV-L.
Comprised of two flashings for roof windows (without top elements and weep flaps) and a universal element for joining two windows at the ridge.